Whether you are watching your favorite TV shows or movie in your home theater or having a cup of evening tea or coffee, a bowl of popcorn makes it really awesome. Gone are the days when people were using the gas stove for popping up the popcorns. This traditional way of making popcorns left behind some unpopped or burned kernels, spoiling your mood and is tricky too. This is where comes the role of most handy appliance Popcorn Makers, you can use very easily at home. With different types of popcorn makers available, we have compiled here the best Hot Air Popcorn Makers and their reviews so that you can make the best pick. There is no doubt that with its crunchy, salty, and buttery flavor, popcorn is the world’s best versatile snack, everyone has the cravings for. Even, it also comes with an awesome nutritional punch. So, why don’t you have a popcorn machine in your kitchen to make healthy, tasty and fresh snack whenever you want. Also, if you are more concerned about your health, and don’t want to consume store-bought or pre-packaged varieties of popcorn drenched in artificial ingredients, and other unhealthy additives, it is best to have a popcorn maker at your home. This way you can make the healthy, tasty, and crunchy popcorn from the comfort of your home. So, all the popcorn lovers are most welcome to this blog that is all about the review and buying guide of the best hot air popcorn makers you can use at your home. For getting the in-depth information on Hot Air Popcorn Makers, please head to our Buying Guide Section. We have picked some of the best brands of hot air popcorn makers that are very easy to use, budget-friendly, and can get your popcorn popping in no time. 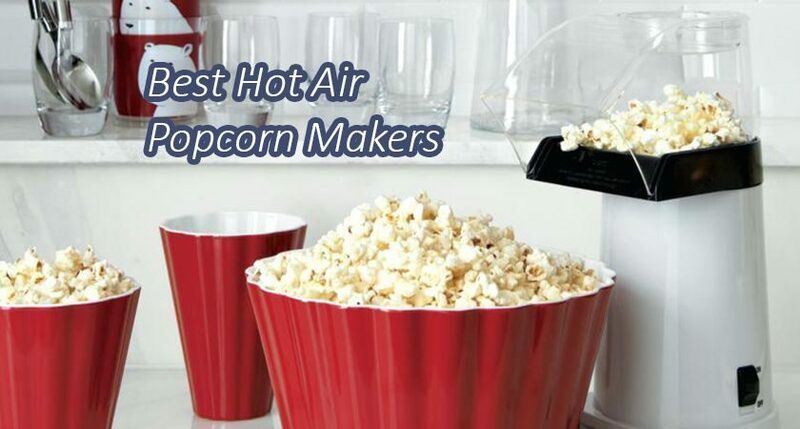 These hot air popcorn makers are also not so messy in making your favorite snack. 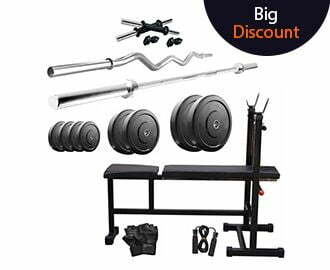 From the size, design, functionality and of course the convenience, we have taken all these things into consideration so that you can make only the best pick. So let’s have a look on our top picked hot air popcorn makers. Homemade popcorn is now getting easy with this hot air popcorn maker from Pigeon. Its hot air circulation technology and simple one switch operation make popcorn making a no hassle and in no time. Also, this appliance comes with consuming just 1200 W of power, so no need to worry about the energy consumption. So, get ready to make delicious and fresh popcorn very easily at home with this popcorn maker. You will definitely love this hot air popcorn maker from the brand GosFrid because of its amazing features. With its quick and efficient operation, this popcorn popper is capable of delivering up to 16 cups of gourmet corn in just 3 minutes. The one key operation makes it so easy to operate, even no longer to wait for your favorite crispy and delicious popcorns. And the best part is that it uses hot air for popcorn popping, so a healthier alternative for your favorite movie-time snack. 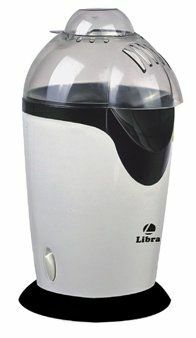 This simple yet efficient electric popcorn maker from Libra can get its job done very perfectly. It uses the hot air circulation technology to make the popcorns without using butter or oil in a matter of minutes. Thus, providing a healthy option for your favorite crunchy snack. It comes with a nonstick frying bowl and rotating bowl that pops great tasting corn evenly without leaving it unpopped. It has a multipurpose lid that you can also use to serve the popcorns. This popcorn maker from Singer combines quality, performance, and versatility all in one. And thus a great pick for getting your favorite snack anytime. 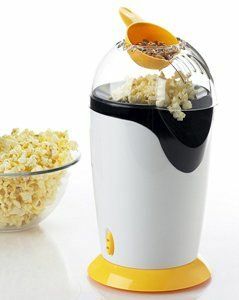 You can enjoy not only the tasty and flavored popcorns but also other snacks too with this popcorn maker. This popcorn popper lets you make a variety of delicious snacks including roasted peanuts, dry fruits, and namkeens, etc. It comes with a heating element that helps you to make your favorite snacks in no time. This is another best hot air popcorn maker from the brand Sheffield. If you want to make the fluffy popcorns in just one minute, this one is absolutely a great purchase. Not only a popcorn maker, but this is a multi-purpose snack maker too. You can easily make other snacks like roasted peanuts, cashew nuts, rice tubes, finger-chips, coffee beans, papad, etc. in this snack maker. Since this popcorn popper uses the hot air technology for making popcorns, it is a great and healthier alternative to no-oil cooking. For the perfect super fluffy, crunchy, and delicious popcorns and other snacks to make, this one electric popcorn maker is the worth purchase. This simple appliance uses hot air circulation technology to make popcorns without using butter or oil. When it comes to design, it is extremely eye-catching with vibrant red and white color. It also comes with a removable chute for easy cleaning. Making popcorn is super easy is with this hot air popcorn maker from the reputed brand Prestige. It comes with a nonstick frying bowl and rotating arm that pops greatly flavored popcorns in a matter of minutes. The best part is that it uses hot air circulation technology for making popcorns, thus providing you a healthier option without even using butter or oil. Its multipurpose lid can be used for serving the popcorns too. What is a Popcorn Maker Machine and how it works? Popcorn makers also known as Popcorn Poppers are really one of the most easiest technological machines to pop the heated kernels of corn for the crunchy and puffy popcorns. These are absolutely the safer and healthier alternatives towards popping the popcorn in a microwave. It just needs no additives, salt, or oil, and makes the super crunchy snack in a matter of minutes. Even there are various types of popcorn makers available in the market which we are going to discuss in the next section, the use of each of them is almost the same. You just need to add the corn kernels in the chamber of the popcorn popper and switch it on. Wait for a few minutes and its ready now. So isn’t it very simple? For extra flavor to enjoy, you can add more seasonings to it. Hot Air Popcorn Makers- These are electric machines that use hot air to pop the kernels and send the finished popcorns out of a shaft in front of the appliance. The best part with hot air popcorn makers is that you don’t need any fat or cooking oil for popping up the popcorns. And hence you will have only fewer calories with this machine. It is very easy to use. You just need to add the kernels in the chamber and let’s do their work. Microwave Popcorn Popper- As the name says, absolutely these are the poppers that you can use in a microwave. This is the easiest way to cook the popcorn in few minutes only. The microwave popcorn makers are made of silicone and other microwave-safe materials. Here, you just need to add the kernels in the popper and microwave it for a few minutes with or without oil. And it is done. Stovetop Popcorn Popper- Stovetop popcorn makers also known as hand crank stirrer, pops the same way like electric popcorn makers. But instead of the electronic base, it comes with a pot to sit on the stove. A crank and stirring rod is there to move the kernels while they are popping. And its built-in lid keeps the popcorn in the pot. The very best part is that you can add extra seasonings or flavor while doing the popup process to spread the goodness to your popcorns. Commercial Popcorn Makers- These are large units with a nostalgic look and operates through a cylindrical unit near the top where you pour either oil and kernels or the commercial popcorn packages. These are ideal to use in carnivals, entertainment centers, etc. Type- We have already discussed about different types of popcorn makers in the above section. If you are going to buy the one for your home, you have to select among stovetop, hot air, or microwave popcorn poppers. So, it depends on you which one you want. Size- Size is the most important factor while buying a popcorn maker for your home. Choose the one that easily fits your kitchen cabinet. Hot air poppers, stovetop poppers, and microwave poppers are ideal if you have less space in your kitchen. But if you have enough space in your kitchen, you can also buy the large oil popcorn makers. Maximum Capacity- Capacity is another critical factor that decides how much amount you want in one go. So, it is always suitable to buy the one having large capacity if you want more and more servings in one batch. Ease of cleaning- If you have made your popcorns with ease in the popcorn maker, it’s time to clean it up. Is it tedious? So, always go for the popcorn poppers which are easy to clean. Another best option is to choose the one that is dishwasher safe making your cleaning task even more easier. Quality- Quality is one such important factor before purchasing any product. And in case of popcorn makers, considering this aspect is very important. It is suggested to always choose the model made up high-quality material and durable too. Also, check that is doesn’t leave the corn kernels unpopped or burnt. This is all about our top picks of the hot air popcorn makers for a healthy snack. With the buying guide, we have provided in the blog; I am sure you are very clear about how awesome to have a popcorn machine at home. All the models and brands we have mentioned above come with special and unique features that we have described in detail in their reviews. So now, it’s up to you. Choose your favorite one and enjoy the healthy and crispy popcorns whenever you want.